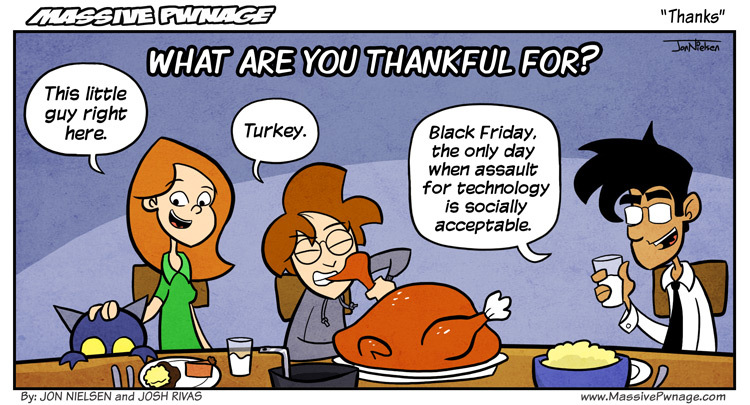 I’m thankful for this webcomic. It’s the best thing I’ve ever done. Happy day before Thanksgiving everybody. Make sure you all eat a ton and then come back on Friday for more Massive Pwnage! This entry was posted on Wednesday, November 24th, 2010 at 12:00 am and is filed under Comics. You can follow any responses to this entry through the RSS 2.0 feed. Both comments and pings are currently closed. If you eat too much, you will become massive, and them we will have Double Massive Pwnage! I think that imp is just seeing if there are lemon doughnuts. Alice being my mom of course, the only one with a serious thankfulness. I am thankful for Massive Pwnage. Nice one guys, thankful for an awesome comic. See you guys online sometime. Locke we must exact revenge for our near defeat.